The Community School in Sun Valley is taking to a "mountains" theme this month with two presentations scheduled for early December, one involving mountain climbing and the other about a woman from the Himalayas. Both events are free to the public and will be held in the Community School Theater. On Saturday, Dec. 3, author Broughton Coburn will present a program titled "Aama's Journey: A Pilgrimage Between Continents and Cultures." The presentation is scheduled from 7-9 p.m. Hosted by Flourish Foundation, an organization dedicated to developing leadership through its Compassionate Young Leaders Program, the presentation will feature Coburn discussing an illustrated program about an elderly Himalayan woman named "Aama." "In 1992, Aama turned 84, a watershed year sanctified by a long-life ritual that relieves the elderly from further worldly duty," states a Flourish Foundation press release. "That's when Aama came to America." The presentation will describe Aama's visit to the United States, including visits with farmers and Native Americans and visits to the ocean and Old Faithful geyser in Yellowstone National Park. "Aama's reactions to our country are amusing, surprising and sometimes disconcerting, yet we find that her emotions and sensibilities live and breath within us all," states the press release. 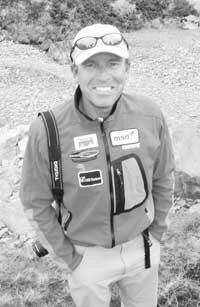 On Monday, Dec. 5, at 7 p.m., the Community School will host a presentation by acclaimed mountaineer and author Ed Viesturs. In a lecture titled "No Shortcuts to the Top," Viesturs will discuss his life story, adventures on the world's highest peaks and how leadership, teamwork and overcoming major obstacles have helped him achieve success. Viesturs, a Community School parent, will meet with students earlier on Monday. "Ed Viesturs is one of the great mountaineers in history, and we are proud to have Ed in our community," said Head of School David Holmes. Viesturs is also an advisor to two new Community School initiatives, the Outdoor Leadership Academy and the Sun Valley Ski Academy.